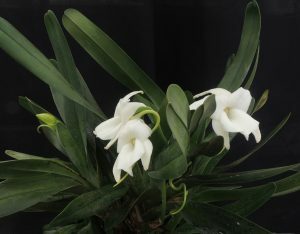 This species from the mountains of central Madagascar is one of our most rewarding orchid species. 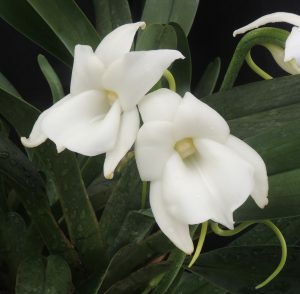 The large (8cm) waxy, pristine white flowers are wonderfully fragrant and currently fill its section with their intoxicating scent. The plant’s natural habitat is in leaf litter amongst quartzite boulders but we find the species enjoys a mossy basket where its roots remain damp and cool. 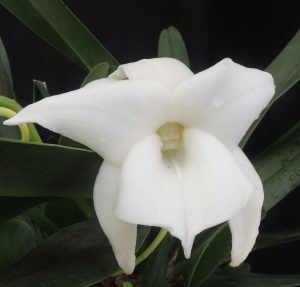 Most of our Angraecum species are warm growing but Angraecum magdalenae does best for us in Cool Asia (minimum 10C) where it is slowly growing into a real specimen with flowers which contrast beautifully with the dark green leaves. We have germinated seed from last year’s flowering and hope to have plants for sale in flask within 18 months. The flowers hold their nectar in long curved spurs suggesting pollination is by one of Madagascar’s large hawk moths.